Background Antiretroviral therapy (ART) has significantly altered the pattern of acute and chronic HIV-related disease. However, it is not clear what this means in terms of respiratory symptoms. We sought to investigate the association between HIV status and respiratory symptoms and how these have changed with the availability of ART. Methods We searched Cochrane, Medline and Embase databases for studies published between 1946 and August 2015 comparing the prevalence of respiratory symptoms in populations with and without HIV infection. We undertook random effects meta-analysis of the main symptoms reported. We studied heterogeneity and completed sensitivity analyses and funnel plots. 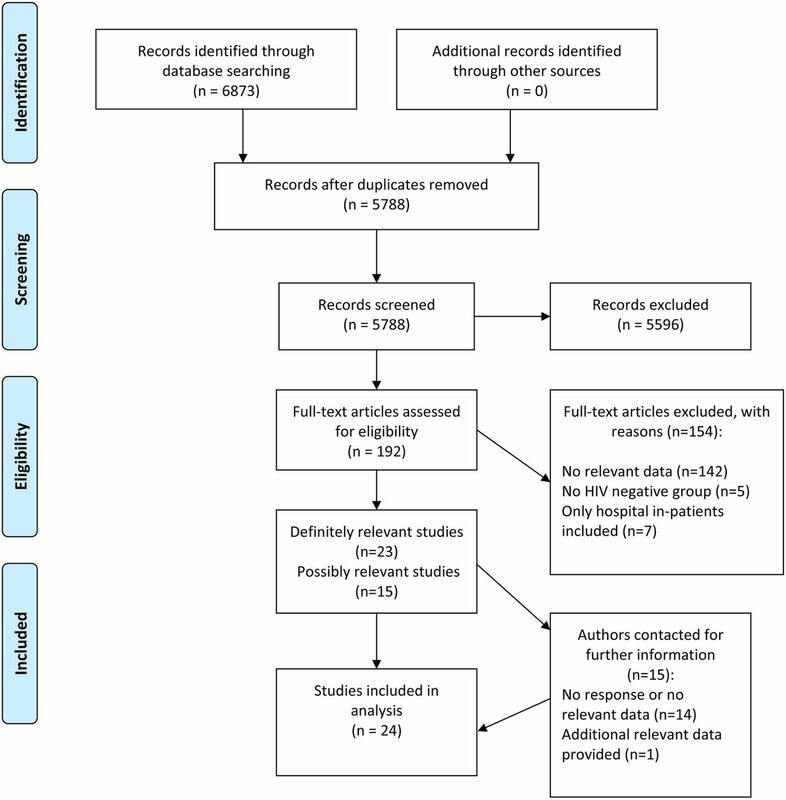 Results From 5788 unique references identified, 24 papers provided relevant data: 18 documented the prevalence of cough and 11 examined the prevalence of breathlessness among other symptoms reported. Compared with the HIV negative, people living with HIV (PLWH) were more likely to have respiratory symptoms with pooled ORs for the prevalence of cough of 3.05 (95% CI 2.24 to 4.16) in resource-limited populations without access to ART; 2.18 (1.56 to 3.18) in resource-rich populations without access to ART and 1.11 (0.99 to 1.24) in resource-rich populations with access to ART. In resource-rich settings, although the availability of ART was associated with a reduction in the difference between HIV-positive and HIV-negative individuals, PLWH were more likely to report breathlessness, OR 1.39 (95% CI 1.11 to 1.73). Conclusions Respiratory symptoms are more common in PLWH than controls. This association persists although at a reduced level in populations with access to ART. Are respiratory symptoms more common in people living with HIV, and what effect has antiretroviral therapy had on this? Our study suggests that respiratory impairment remains more common in HIV-positive adults despite the use of antiretroviral therapy. This is the first systematic evaluation of existing evidence regarding respiratory symptoms in people living with HIV, summarising the current evidence base and highlighting where deficiencies in this exist. Antiretroviral therapy (ART) has altered the natural history of HIV-associated respiratory illness such that acute, life-threatening opportunistic respiratory infections (eg, Pneumocystis pneumonia) are much less common. This has reduced the incidence of AIDS-related respiratory pathology, for instance, there is clear evidence of a reduction in the incidence of TB after ART in all CD4 count strata.1 This means that HIV infection can be a manageable chronic illness, with people on ART having a life expectancy approaching that of the general population.2 However, HIV-positive people appear to continue to have an increased frequency of respiratory illness compared with the general population.3 This is important given that respiratory conditions are likely to become more common as populations age. Although objective impairment of lung function has received considerable recent attention, less attention has been paid to the symptoms that such individuals may experience. This is important, as lung function impairment can correlate poorly with symptoms and functional status.10 We sought, therefore, to provide a comprehensive analysis of existing data regarding respiratory symptoms in people living with HIV with the aim of understanding how this might have changed with ART, and where deficiencies in the current evidence base exist. We provide a systematic review of the evidence regarding respiratory symptoms from population-based studies directly comparing HIV-positive and HIV-negative individuals with or without ART in both resource-limited and resource-rich settings, and a meta-analysis of the effect of HIV infection on the prevalence of these symptoms. Our aim was to evaluate evidence regarding the relative frequency of respiratory symptoms in HIV-positive and HIV-negative populations. We chose search terms that would capture any respiratory symptom (excluding those arising from pathology of the ear, or of obstructive sleep apnoea). We did not seek to set rigid definitions, for instance, regarding the duration of symptoms required to distinguish chronic from acute cough, and instead used those provided by the investigators of the primary studies. This review was registered with the PROSPERO database and details of the protocol are available (PROSPERO 2015:CRD42015013762). We completed a systematic literature search of publications in the MEDLINE, EMBASE, Cochrane and CINAHL databases between 1946 and August 2015, as well as search of abstracts from the Conference of Retroviruses and Opportunistic Infections and International AIDS Society and American Thoracic Society conferences since 1982 where available. Searches were limited to humans and there was no language limitation. Search terms included ‘HIV’ OR ‘Human Immunodeficiency virus’ OR ‘AIDS’ AND ‘Signs and symptoms, respiratory’ (MeSH heading) OR ‘cough’ OR ‘breathless’ OR ‘dyspnea’ OR ‘haemoptysis’ OR ‘short of breath’ (see online supplementary appendix 1). Studies were included if they were published in peer-reviewed journals and included both HIV-positive and HIV-negative participants, measured respiratory symptoms in each group and provided quantitative data. All age groups were included in the review and there were no language restrictions. Exclusion criteria were as follows: studies reporting symptoms of obstructive sleep apnoea (such as hypersomnolence); studies reporting symptoms arising from the ear (such as ear pain, discharge or hearing change); studies that did not include HIV-negative individuals; and studies reporting data with the intention of describing a specific condition (eg, TB, bacterial or Pneumocystis jirovecii pneumonia) rather than the occurrence of symptoms within the general or HIV-positive population. This included studies evaluating hospital in-patients alone, as these would not be representative of the population as a whole. We did not exclude population-based studies if, by chance, they contained people with prevalent respiratory conditions as part of the general (HIV-positive or HIV-negative) population under test. All abstracts were independently reviewed by two members of the review team. Shortlisted full-text articles were then jointly reviewed by two reviewers based on the inclusion/exclusion criteria. Where necessary, discrepancies were resolved by discussion with a senior member of the team. Data were extracted on the following study characteristics: study design, date of study, age and gender of participants, prevalence of tobacco smoking, risk of acquisition of HIV, geographical location(s) of study, number of HIV-positive and HIV-negative participants, frequency of respiratory symptoms, description of respiratory symptoms/tool used to evaluate, availability of antiretroviral treatment, treatment provided for the respiratory illness, level of immunocompromise in the HIV-positive group (eg, median blood CD4 count). The risk of bias in observational studies was assessed using a modified Newcastle Ottawa Scale (see online supplementary appendix 2);11 the version used by Herzog et al for the evaluation of cross-sectional studies was modified with criteria selected appropriate to this field.12 This scale awarded up to eight points to each study: three points for the adequate selection of participants, three points for comparability of the HIV-positive and HIV-negative participants included in the study and two points for the assessment of symptoms and reporting of statistical tests. In this scale, stars are awarded for higher scores in each criterion, giving a total score out of a possible 8 stars. We defined studies of high quality as those that scored 6–8 stars, moderate quality 5 or 6 stars and low quality those with 0–3 stars. The relative prevalence of respiratory symptoms in HIV-positive and HIV-negative groups was compared using ORs: although different definitions of symptoms were used by the investigators of the primary studies (meaning that the absolute prevalence of particular symptoms varied considerably), the relative frequency of symptoms in HIV-positive and HIV-negative participants could be compared by means of ORs, thus allowing estimation of the effect of HIV infection on the likelihood of having these symptoms. Studies of adults were stratified by location of study into resource-limited and resource-rich settings (which also equated with high and low TB prevalence and high and low HIV prevalence settings) and availability of ART (as reported by the authors). This stratification was undertaken because the aetiology and determinants of respiratory illness were likely to differ between these settings. Studies evaluating children were not included in the quantitative synthesis as these represent a unique population and these studies were highly heterogeneous in methodology and outcome. Meta-analysis was conducted using RevMan V.5.3 (The Cochrane Collaboration, 2014). Pooled ORs for the presence of specific respiratory symptoms were calculated within each stratum wherever more than one study provided data. The DerSimonian and Laird random effects model was used to account for between-study heterogeneity. Statistical heterogeneity was assessed using the Cochran χ2 test and the I2 statistic was used to summarise the degree of variation; causes of heterogeneity were further explored by meta-regression. 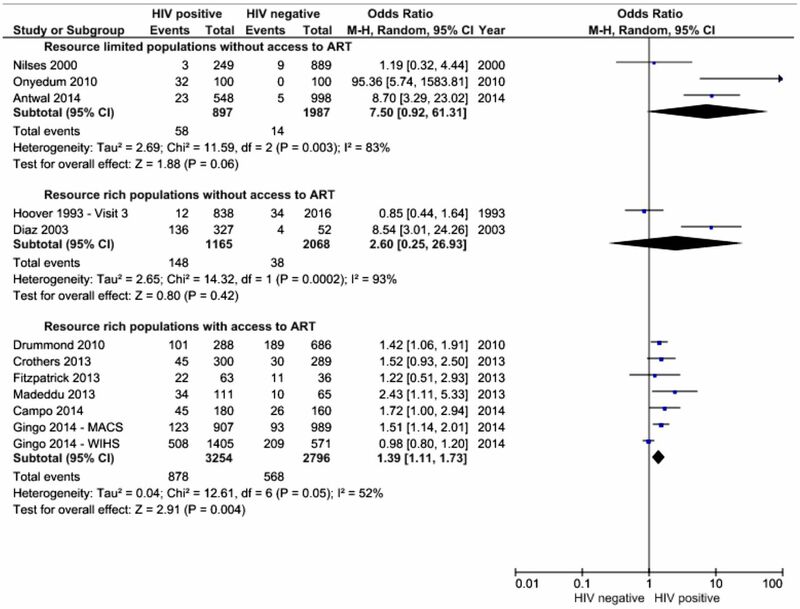 A priori factors chosen for meta-regression were the proportion of HIV-positive individuals with undetectable viral load and the log OR of smoking in HIV-positive versus HIV-negative groups. The possibility that small studies have more extreme results (due to reporting bias) was assessed by the visual inspection of funnel plots. A total of 5788 publications were identified by our database search after removal of duplicate publications. Of these, 5596 were excluded after review of the article title and abstract. One hundred and ninety-two potentially relevant articles were reviewed in full text, of which 154 were excluded; reasons for exclusion are given in figure 1. Twenty-four publications were included in the final list for review (table 1). Using a modified Newcastle Ottawa Scale, 6 studies were rated as low quality, 14 as moderate quality and 4 as high quality (see online supplementary appendix 3). All studies included were observational studies, although two papers investigated cohorts recruited as part of randomised trials.20 ,24 With the exception of five studies following birth cohorts over time, all studies were either cross-sectional in nature or reported data arising from prospective cohorts at a single time point. The earliest study recruited patients from 1985,15 with the most recent provided data collected in 2012.32 Eight articles reported research conducted in the USA (detailing 9 separate studies), with 12 studies conducted in Africa, 2 in Asia and 2 in Europe (both from Italy). Nineteen studies included adult patients and five evaluated infants only. Twelve studies provided data regarding respiratory symptoms in HIV-positive adults without access to ART (tables 2 and 3). All of these demonstrated a greater proportion of HIV-positive participants with respiratory symptoms. Five studies reported prevalence of breathlessness (two from the USA, others from Nigeria, Zimbabwe and India). Three studies provided data on respiratory symptoms in HIV-positive populations in the first decade of the HIV epidemic in the USA. The Multicenter AIDS Cohort Study collected data from a cohort of MSM at four sites from 1985 onwards; el Sadr et al studied a cohort of injection drug users in New York and Diaz et al evaluated a cohort of predominantly white men in Ohio. Data on respiratory symptoms in these populations are presented in table 3. Nine studies reported the prevalence of respiratory symptoms in HIV-positive and HIV-negative individuals without access to ART in resource-limited settings, and seven of these were in sub-Saharan African populations. The earliest of these used data from Rwanda collected in 1988, and the most recent was from Antwal et al in 2014. Only two studies evaluated populations outside of the USA and Africa (Kheaw-on et al in Cambodia and Antwal et al in India). Five studies reported the prevalence of respiratory symptoms in HIV-positive and HIV-negative children (table 4). All of these evaluated cohorts of vertically infected infants followed up from birth, and no studies assessed older children. The earliest was conducted in Rwanda from 1988 with subsequent work in Malawi and Zimbabwe. None of these study populations had access to ART. One study evaluated symptoms in HIV-positive infants born in Chieti, Italy; this suggested a lower frequency of ‘wheezy respiratory illness’ in HIV-positive infants despite more maternal smoking, premature delivery, low birth rate and formula feeding. However, the design of the study (based on routine clinic records) did not allow appraisal of the possibility of differences in health-seeking behaviour or reporting of acute respiratory illness, which could bias the comparison of respiratory symptoms between the different groups. Six studies (using data from seven cohorts) reported on adults with access to ART. All were from resource-rich settings other than one from South Africa. Data on respiratory symptoms are presented in tables 5 and 6. All contained a high proportion of current smokers in both the HIV-positive and HIV-negative groups and, where reported, often had high rates of former or ongoing recreational drug use. The first systematic comparison of respiratory symptoms in a HIV-positive population with access to ART with HIV-negative comparators is provided by the AIDS Linked to the IntraVenous Experience (ALIVE) cohort of former and current injection drug users in Baltimore, Maryland, USA.27 This found no difference in frequency of current cough, although a history of ‘wheezing’ was reported by 50% of HIV-positive and 37% of HIV-negative participants. Several cohort studies have addressed respiratory symptoms in HIV-positive individuals with access to ART in the USA: the Women's Interagency HIV Study (WIHS); Multicentre AIDS Cohort Study and the EXHALE substudy of the Veterans Aging Cohort Study.32 ,36 Tobacco use was high in these cohorts, and smoking was more frequent in the HIV-positive than HIV-negative groups (reported in 39%–64% and 23%–58%, respectively). The prevalence of respiratory symptoms was high in these populations, for instance Fitzpatrick et al7 described breathlessness in 35% of HIV-positive and 31% HIV-negative participants in the WIHS study and Campo et al 32 reported cough in 25% of HIV-positive and 16% in HIV-negative participants in the EXHALE VACS substudy. There is little information comparing respiratory symptoms in HIV-negative and HIV-positive individuals with access to ART outside of North America. The only study providing data from Europe documented the presence of any respiratory symptom in 47% HIV-positive participants and 23% of HIV-negative participants, with 32% vs 14% reporting cough (p=0.006) and 31% vs 15% breathlessness (p=0.02).30 Telisinghe et al34 evaluated a prison population in South Africa (with a 25% HIV prevalence) in which cough lasting 2 weeks or more was present in 13% of HIV-positive and 8% of HIV-negative individuals. 36% of the HIV-positive participants reported the use of ART. The prevalence of tobacco smoking was only consistently reported in studies undertaken in resource-rich settings with access to ART. In all of these studies, a large proportion of both HIV-positive and HIV-negative participants were current smokers (see table 5), and this was similar across these groups. Data were available on 12 075 HIV-positive individuals compared with 24 450 individuals without HIV infection. The symptoms for which sufficient data were available to allow quantitative synthesis were cough and breathlessness. Figures 2 and 3 demonstrate the ORs for the presence of cough and breathlessness in those with and without access to ART and in resource-rich and resource-limited settings. Forest plot of ORs for presence of cough, stratified by availability of ART and location. ART, antiretroviral therapy; MACS, Multicentre AIDS Cohort Study; WIHS, Women's Interagency HIV Study. OR for the presence of breathlessness, random effects meta-analysis stratified by location and availability of antiretroviral therapy. Breathlessness was also assessed, although fewer studies reported this. In resource-limited settings without access to ART, the OR for the presence of breathlessness was 7.5 (0.92 to 61.31, I2=83%). Only two studies were available from resource-rich settings without access to ART, and meta-analysis of these data provides an OR of 2.60 (0.25 to 26.93, I2=93%). In resource-rich settings with access to ART, there was good evidence for a higher rate of breathlessness in HIV-positive individuals with an OR of 1.39 (1.11 to 1.73, I2=52%). Two studies (Onyedum 2010 and Antwal 2014) included in the analysis of respiratory symptoms in populations without access to ART were judged to be at high risk of bias due to the inclusion of significant numbers of participants presenting for care with acute respiratory illnesses due to their methodology (which involved recruitment within acute care services).32 ,33 Exclusion of these studies reduced somewhat the effect size for the prevalence of cough to an OR of 2.84 (2.45 to 3.30) as well as the heterogeneity in this analysis (I2=55%). Four studies (all in populations with access to ART) used the MRC dyspnoea scale to measure breathlessness (see table 5). A meta-analysis including only studies using the MRC dyspnoea scale (with breathlessness defined as a score of ≥2) did not significantly change the effect size (compared with the analysis of all studies reporting the prevalence of breathlessness in populations with access to ART) but reduced heterogeneity significantly (OR for having MRC dyspnoea ≥2=1.50, 95% CI 1.21 to 1.85, I2=0%, online supplementary figure S3). The true effect of HIV status on respiratory symptoms may be exaggerated by the higher proportion of HIV-positive subjects who were current smokers in several of the included studies, as few studies provided data adjusted for smoking status. Meta-regression confirmed an association between higher rates of respiratory symptoms in studies with a greater imbalance of smokers versus non-smokers in the HIV-positive compared with HIV-negative group (data not shown). However, this had little impact on the estimated effect of HIV infection on the frequency of cough or breathlessness. 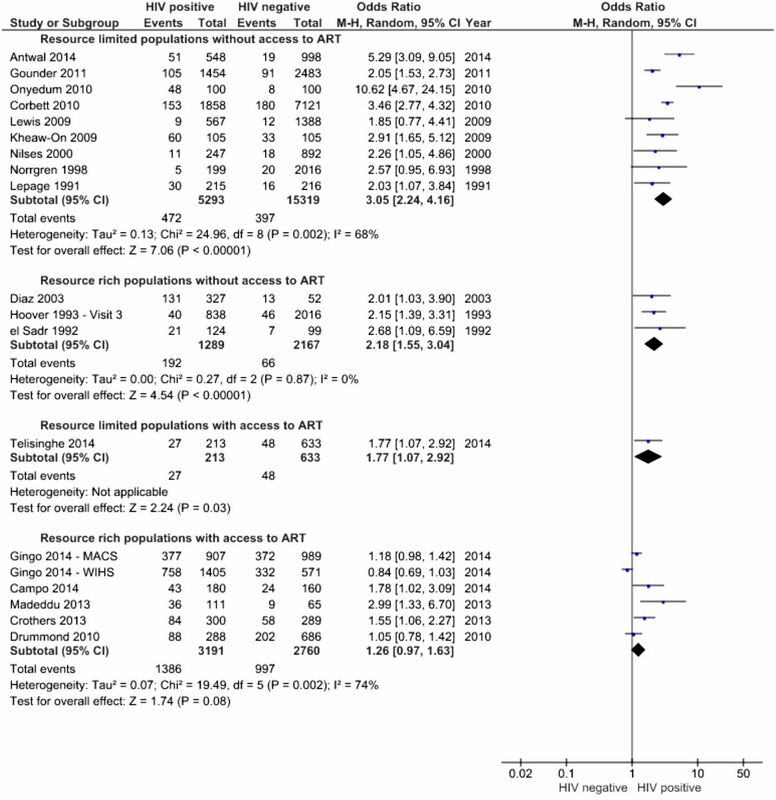 This systematic review and meta-analysis demonstrates that despite the availability of ART, HIV-positive populations continue to experience more respiratory symptoms than comparable HIV-negative groups, at least in resource-rich settings for which there are sufficient data to draw conclusions. It also highlights several research needs: in particular the lack of rigorous data concerning respiratory symptoms in HIV-positive populations in low-income and middle-income settings where the majority of the world's HIV-positive individuals live. The successful provision of ART means that HIV-positive populations can expect considerable improvements in life expectancy;38 however, ageing HIV-positive populations have more comorbidities and respiratory illness is likely to become increasingly important over time.39 ,40 An improved understanding of the health needs of ageing HIV-positive populations is required, as even in resource-rich settings, the impact of respiratory illness on individuals (measured by instruments designed to evaluate health-related quality of life) or at a societal health-economic level is evaluated infrequently in HIV-positive populations. Strengths of this analysis include a comprehensive search strategy and robust methods for study selection. Limitations include the lack of standardised assessments of respiratory symptoms in the primary studies, and incomplete reporting of important confounding factors (eg, smoking and recreational drug use), which may influence the effect sizes found. The incomplete reporting of exposures such as tobacco smoking and drug use in the original papers means that the extent to which the association identified between HIV status and respiratory symptoms is a direct result of the HIV virus is uncertain as we were not able to adjust for differing exposures to these possible confounding factors between HIV-positive and HIV-negative individuals. Another important limitation is that the data included in the quantitative meta-analyses were cross-sectional in nature and we cannot therefore infer causation from such studies. Bias or confounding in the primary studies may be one cause of the association between HIV status and respiratory symptoms found, and the strength of conclusions that can be drawn is therefore limited by the paucity of evidence in many areas. One difficulty when evaluating respiratory symptoms is the challenge of standardising assessments: The wide range in the reported frequency of respiratory symptoms arises in part from the diversity of methods used to evaluate them: the definitions used for symptoms such as cough or breathlessness were often not stated, and a minority of studies used validated tools such as the St George's Respiratory Questionnaire,45 American Thoracic Society Division of Lung Disease questionnaire46 or the MRC dyspnoea scale (see tables 2⇑⇑⇑–6 for details of data collected in each study).35 Furthermore, results were presented as the proportion/number with respiratory symptoms, with no study reporting estimates adjusted for potential confounders. It is important to note that although populations may have access to ART, most studies include a significant proportion of participants who were either not using ART, or who do not have an undetectable viral load. We cannot therefore estimate the effect of HIV infection at an individual level in those with a favourable virological and immunological response to ART. Furthermore, most of the data regarding populations with access to ART derive from the USA and there is limited information from other settings. Exposures of importance that could lead to respiratory disease may differ in other locations, and the findings of the studies included in this review may not be generalisable—for instance, to HIV-positive African populations using ART. Furthermore, as highlighted in this review, there is little available evidence regarding the determinants of respiratory illness in HIV-positive individuals in resource-limited settings, where the majority of the world's HIV-positive individuals live. We thank Ruth Muscat from the Royal Free Hospital library for assistance with database searches, and Monica Campo, Kristina Crothers, Jennifer Read and Jim Todd for providing their study data for analysis within this paper.
. Signs and symptoms of “asymptomatic” HIV-1 infection in homosexual men. Multicenter AIDS Cohort Study. J Acquir Immune Defic Syndr 1993;6:66–71.
. Natural history of human immunodeficiency virus type 1 infection in children: a five-year prospective study in Rwanda. Mother-to-Child HIV-1 Transmission Study Group. Pediatrics 1999;104:e56.
. Symptomatic HIV-infection in infants according to serostatus of mothers during pregnancy. East Afr Med J 1999;76:566–70.
. Reduced frequency of wheezing respiratory illness in infants with perinatal human immunodeficiency virus-type 1 infection: a model for immunologic and inflammatory mechanisms of airway obstruction? Pediatr Allergy Immunol 2003;14:42–9.
. Bronchial hyperresponsiveness in HIV patients with CD4 count less than 500 cells/μL. Asian Biomed 2010;3:255–60.
. Respiratory symptoms and ventilatory function tests in Nigerians with HIV infection. Afr Health Sci 2010;10:130–7.
. Clinical profile of HIV infected patients attending a HIV referral clinic in Pune, India. Indian J Med Res 2014;140:271–7.
. Standardised questionnaire on respiratory symptoms: a statement prepared and approved by the MRC Committee on the Aetiology of Chronic Bronchitis (MRC breathlessness score). Br Med J 1960;2:1665.
. Cochrane handbook for systematic reviews of interventions version 5.1. 0. Vol. 5. The Cochrane Collaboration 2011.
. Epidemiology Standardization Project (American Thoracic Society). Am Rev Respir Dis 1978;118Pt 2):1–120. Contributors JB, AR, MJ, ML and IA planned the study, and JB is the guarantor of the work. JB, AR and SF undertook the literature review and selection of studies for inclusion in analysis. JB and AR undertook appraisal of the studies. JB and RH undertook statistical analysis. JB drafted the paper, and all authors revised and approved the final draft paper. Funding JB is supported by an NIHR Doctoral Research Fellowship (DRF-2015-08-210).